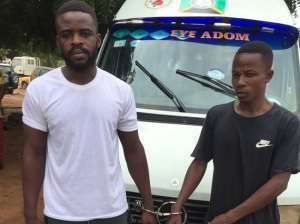 A commercial vehicle driver and his mate, who were captured on video mercilessly beating up a policeman, have been arrested by the Odorkor Police. Francis Buabeng, a 26-year-old driver and Albert Ansah, a 33-year-old driver's mate, were arrested after a formal complaint was lodged by the assaulted police officer to the Odorkor Police. The victim, Constable Julius Mawuli Ekpe, attached to the Regional Visibility Unit, who sustained various degrees of injury, has been treated and discharged at the Police Hospital. The vehicle has also been towed to the Odorkor Police Station while investigations into the matter continue. Briefing DAILY GUIDE on the arrest, DSP Afia Tenge said the incident occurred on March 14 at Mallam in Accra. She said constable Ekpe was on duty on the Kasoa-Mallam road and spotted a sprinter commercial (trotro) bus with registration number AW 855-14 loading passengers in the middle of the Kasoa-Mallam highway. “The policeman approached the driver to move his vehicle from the road but the driver and his mate who were busily calling for passengers refused to move,” she narrated. She said two other oncoming vehicles crashed and a motor rider also hit another private car in the process as a result of the way the 'trotro' parked in the middle of the road. The sprinter driver upon realising that his action had caused accidents, sped off from the scene. DSP Tenge said the police officer, who was then using a motorbike, gave them a hot chase and stopped them at the Mallam Traffic Light area. In the course of arresting the driver for the traffic offence, the driver and his mate got furious and gave the policeman a sound beating. A passenger secretly videoed the incident and posted it on social media. Constable Ekpe, during the course of the melee, called for reinforcement but by the time the reinforcement team arrived, the driver and his mate had fled from the scene abandoning the vehicle. The police towed the vehicle to the Odorkor Police Station where the police officer lodged his complaint. The Accra Regional PRO noted that suspects Buabeng and Ansah also went to Mallam Police Station to lodge a complaint against the police officer. “It was after the video had gone viral that we discovered that it was the same case lodged at two different police stations,” she stated. DSP Tenge said that with the help of the vehicle owner, the driver and his mate were apprehended to assist police with investigations. The two arrested suspects, she said, had been provisionally charged with four counts, including conspiracy to commit crime, assault on public officer, causing damage to police accoutrements and obstruction.